Jack's Opinion: First Palm, then RIM and then Facebook? You might ask what Facebook has to do with Palm or RIM. But at the end of the article you might get the point. Palm was in the 90th the rising star. They came out in 1993 with their palm pilot and their innovative Palm OS. One of the best OS at its time. Palm in the time did reinvent hand writing rather than the palm pilot needs to learn the users writing, the user had to learn how to write as the palm can understand. At the time all others tried to build complex software for computers to understand different hand writing styles. It took me maybe three days to learn how to write on the palm and then it was just easy. Palm eventually became big and hired a lot of people. Every year came a new model out, better faster etc, even with a color screen. Palm allowed other companies to write application for the palm and users could choose from hundreds of extra apps to install on the palm. The concept was similar to Apple. Palm developed hardware and OS. Palm was on top and the leading company for handhelds, but their biggest problem was, that they had only one product. Instead of working on new products, besides handled, they focused too much on the handheld competition and lost the race. Palm is today a small devision of HP and only delivers the webOS which is Palm's latest OS based on Linux. RIM (founded 1984) a Canadian company started in 1998 to sell Inter@ctive pager 950 which had two way paging and wireless e-mail network. About the size of a bar of soap, this device competed against the SkyTel two-way paging network developed by Motorola. The big break through came 1999. In 1999, the Blackberry wireless e-mail device, the BlackBerry 5790, was revealed along with the Blackberry Enterprise Server (BES) for Microsoft Exchange. The BES provided the conduit between the wireless handheld and the corporate Exchange mailbox, with contacts and calendar, putting current business e-mail in the hands of the mobile worker. New content updated in the mailbox was “pushed” out to the BlackBerry keeping the worker up-to-date. The first fully integrated phones were shipped with the 6200 series after the 5810 and 5820 provided phone functionality only with an external headset. RIM also expanded its network coverage from GSM to add CDMA. In 2010 RIM did fall back to 3rd place. 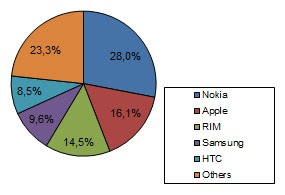 RIM had even a much higher market share in companies. But many companies did start to switch Apple iPhone. Our company had only blackberries for our sales people in 2008, today our salesforce is using only iPhones. We are not big, but we have hundred or so sales people. 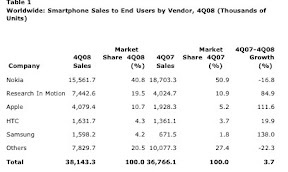 RIM lost their momentum because they tried to fight against Google Android and Apple iPhone. RIM announced that they will lay off 2000 people. They should have extend their business to other types of products, when they were still the rising star. Now it is almost too late and RIM can be soon history. A much bigger fall is actually Nokia. Once unreachable number one cell phone company with over 50% market share, did fall down to just 20% in 2011. Let us look at Apple. Apple was almost bankrupt when Steve Jobs came back in 1997. He did the right thing, he throw all kind of products away and concentrated on building just a few but great products (similar like Palm and RIM), However when the success started for Apple again, he did not stop. Apple did build new products. The trick behind was, that they took time to make the products good. 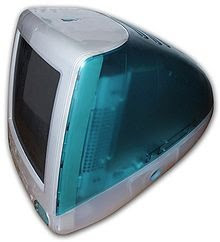 They started with a revolutionary iMac. Just one form factor. It got successful. In the meantime they started to work on the iPod but did not release the iPod before it was ready for the world in 2001. And then a few years later the next product came and so on. But different than other hardware companies, they did not just throw products on the market, they took time to build them. Apple could have just stopped with the iMac and build every year new models and some more sizes. But they did not. They have one product with max two versions. As soon the product does get very successful they bring out something new. This Apple concept is genius. And any company should learn from it. Imagine Apple would have stayed just with the iMac or maybe just with the iPod? Apple would be a small company today. Back to my headline. What does this has to do with Facebook? Facebook did grow tremendous in the last 3 years and grew from 20 million to 700 million users. This is amazing. However Facebook has still one flaw which will kill Facebook (I think FB is already dead, they just don't know it). FB has only one product. The product which gave them success. But instead of building new products they just stay with their social network. Google+ will not kill Facebook but FB will kill themselves. Everything they do is around their FB, new features, layout changes or like recently a business Facebook. Google is smarter, they extend their business with new products. If nobody searches anymore on google, then they have still their ad servers for other companies to serve ads, and they have Android etc. Bottom line is, that having just one product is great to get big, because you can concentrate just on this and make it perfect and it is easier for marketing. However when a company reaches the point, where they are market leader then they need to have already a different product to redefine their market niche. Jack Welsh once said, it is easier to get to number 1 than staying to be number 1. Why is it bad to have just one product? First of all other can learn from your product and after a while they can make it better, because they saw the mistakes, the things which are missing and have more fresh ideas. Second, consumers needs are changing. Social is big today, but maybe not anymore tomorrow. I think social will not go away, however there will be no need in the future for one big social network because it will be a part of our online life. It is like the internet. AOL got big, because we needed an access point for Internet and there was AOL which offered it for us, but then when Internet got big, AOL was not anymore needed we suddenly could go to the internet without AOL. Palm, RIM, Nokia, myspace, AOL were once the stars, now their light is out of fading. And all ends that Palm, RIM and Facebook are so different but similar.